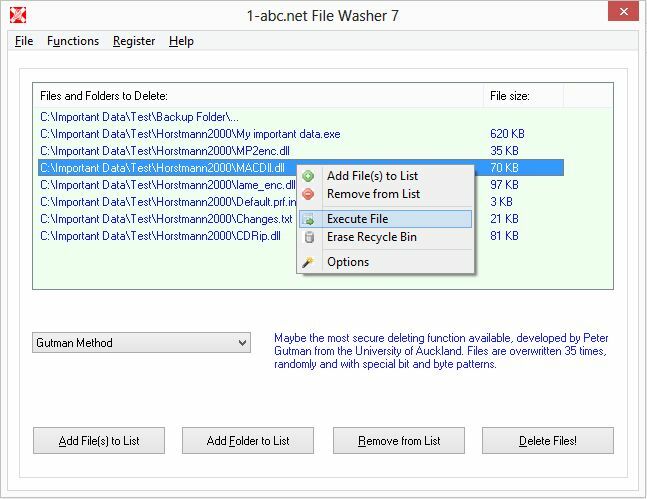 1-abc.net File Washer - Erase files completely! When you use the fast and normal Windows deleting function for files they are not erased from your hard drive completely, even if you do not use the recycle bin for security reasons. What happens instead? Windows only removes the directory’s file entry but not the file data itself that was written on your disk. So there are lots of intelligent tools available that can reverse such deleting processes, just search for “un-erase” or “un-delete” with Google. Fortunately, 1-abc.net File Washer makes all these programs useless! 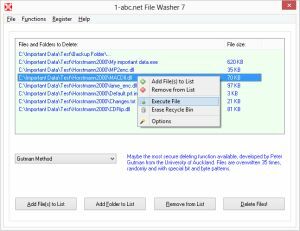 By deleting files with that program, you can switch between 11 different deleting methods, and all of them overwrite your old file before removing so the only thing that could ever be recovered will be senseless data. By the way, one of these deleting procedures is the famous “Gutman Method”, that probably is one of the best ways to erase data by overwriting it 35 times - even many secret agencies and defence departments in the world do not use such complicated erasing features! And as a special fun feature we added a deleting method that overwrites the files you want to delete with another file, so whenever someone tries to reverse the wiping, he only gets the things you want him to receive, e.g. a txt file including messages like “Thank you for trying to un-erase my data, but unfortunately you are not allowed to get it :-)”.